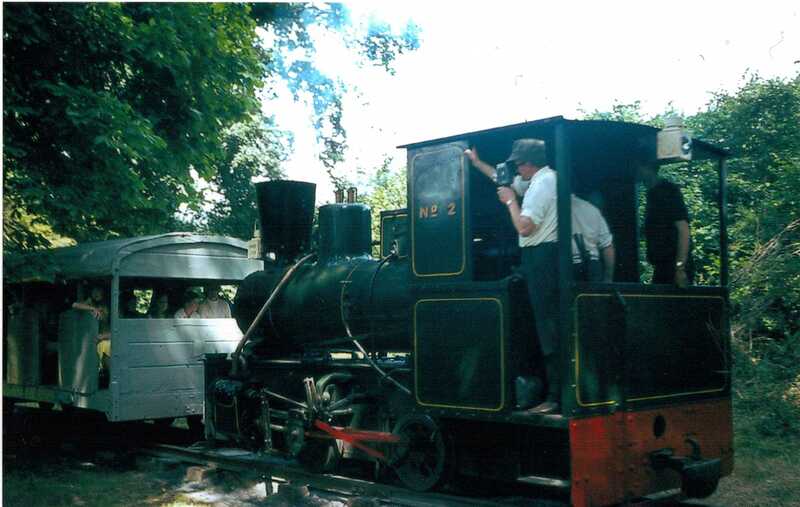 A brief History of the Irish Steam Preservation Society and its Railway at Stradbally Hall. The railway at Stradbally owes its origins to the Traction Engine Rally held behind the Market house in Stradbally in 1965. Some engine owners decided to approach Major E A S Cosby with a view to holding an annual event but in the more convenient location of Stradbally Hall Estate. Agreement was reached and this arrangement has become a constant and very successful fixture on the August bank Holiday Weekend each year. The initial railway at Stradbally Hall was conceived after stationery steaming of newly acquired Guinness Brewery locomotive No.15 at the entrance to the inaugural Rally under the banner of the newly formed Irish Steam Preservation Society in 1966. The locomotive was placed on blocks at the entrance to the rally and attracted much favourable attention. This was the catalyst for the development of a railway line in the grounds of the estate. 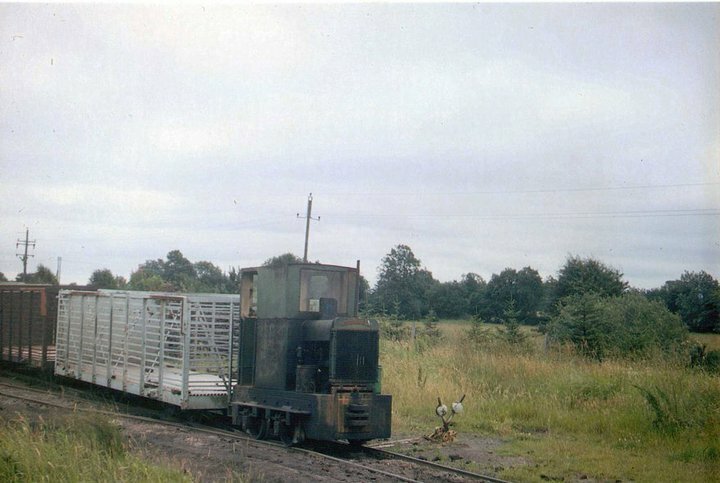 For the 1967 Rally approx 50 yards of track were laid which No.15 was used on, following on from this the track which was of the bullhead type rather than the flat bottomed 74lb rail subsequently adopted was extended further for the 1968 event and passengers were conveyed in former Guinness passenger trucks also acquired from the brewery. At this point a notable development occurred a short distance away close to the Laois/Offaly border as the Irish Turf Board (Bord na Mona) decided to dispose of its small fleet of 3ft gauge steam locomotives from its Depot at Cushina outside Portarlington. The society decided to purchase 2 of the machines No.2 and No.3. No.3 was sold on to Lord O’Neill and it ran for many years at Shanes Castle and in 2002 moved to a new home at Giants Causeway on the rebuilt railway from there to Bushmills. No.2 was put into service at Stradbally for the 1969 Rally after some 3ft gauge track was laid and with a more suitable and robust locomotive the line extended in piecemeal fashion over the ensuing years. The Guinness loco was relocated to the Steam Museum on the Main St in Stradbally along with one of the passenger trucks. Two of the passenger wagons used on the 1ft 10 gauge line returned to the Guinness Museum in Dublin, the bullhead rail 1ft 10ins line was lifted thereafter. The initial passenger accommodation on the new 3ft gauge line was due to the kindness of Bord Na Mona and the “Presidential” Saloon from Clonsast served for the 1969-1970 Rallies with several 4 wheel vehicles being provided for the 1971 and 1972 Rallies. However what the Society wanted was something more along the lines of the Toastrack style of the Clonsast saloon and a former Cavan and Leitrim Railway carriage was bought from Bord na Mona and fitted with new bodywork built locally by Joseph Bennett and Sons in Stradbally and made its debut for the 1973 Rally. The work then turned to extending the length of track available each year for the rally, initially various ideas were mooted to run right around the estate in various routes examined but it was decided the best balance of the manpower and resources available would be achieved by working towards an elongated balloon loop reached by a 1/3 km long line from the station down into the woods where there is a junction, here the line divides with trains normally taking the points in the reverse position and following the course of the parallel “Cork Road” until a former accommodation crossing is reached whereby the line turns sharply East and climbs back towards the junction and back to the station. The loop was completed in 1982. There is also a run round loop located alongside the passenger platform but in practice it is used as two separate sidings, one for stock storage and the other for loco stabling. In the 1980s the need for some support for No.2 became apparent as without Steam the railway became a railway without any motive power. 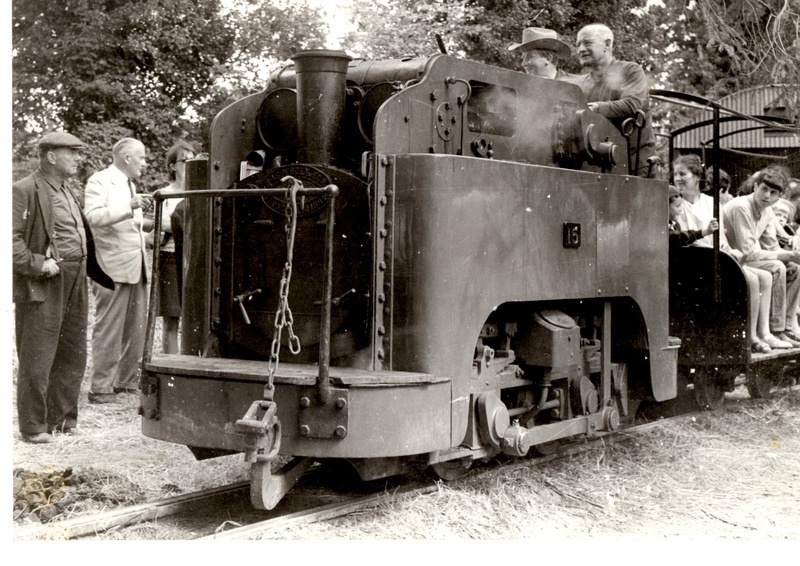 The first diesel in Stradbally was a Hunslet 4wDM built in 1941 works number 2280 which was acquired from Irish C.E.C.A at Allenwood Co.Kildare, this loco ran briefly at Stradbally but suffered engine failure shortly after arrival and was never repaired. It is still on the railway stored on the loop siding effectively a buffer stop. It is due to move to the Cavan and Leitrim Railway at Dromod in August 2011. 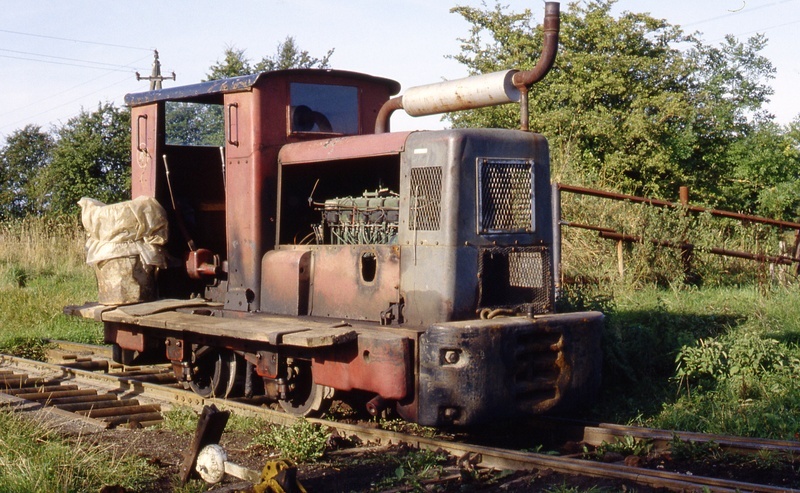 The first successful diesel to arrive was a Planet 4wDM “Nippy” works no. 2014 of 1936 which came to us from Shanes Castle in April 1986. In its 25 years at Stradbally it has performed all kinds of work from passenger, double headed passenger, ballast, track material, rail trains and hauling No.2 out of the shed at the start of running days! We can proudly say it’s the only thing to never let us down during its time in Stradbally! The demise of the ESB Power Station at Portarlington in 1988 led to the Society gaining its third diesel loco which was donated to us in 1988. It is a Ruston 4wDM of the 48DL type, unlike its Bord na Mona contemporaries it was fitted with a Lister HR6 engine in 1982 for the ESB before withdrawal coming to us with a virtually unused engine and near new wheelsets. Like “Nippy” the Ruston has proved a true workhorse and is exceptionally reliable working the passenger service without any failures from 2002-2009 while No.2 was out of action. Since August 2010 the Ruston has been busy working the lions share of infrastructure trains seeing use 7 days a week for much of 2010 on ballast and rail trains. During the 1980s the visitor numbers to the railway were exceeding the capacity of carriage No.7 and the opportunity was taken to purchase a wagon from Shanes Castle which had originated on the former British Aluminium railway at Fort William in Scotland. The wagon was converted to a brake van with parts from a Waterford, Limerick and Western Brake van and entered service with a toastrack body similar to no.7 in 1990. The two carriages have together formed the regular passenger train at Stradbally up to the present day. There have been two periods of steam absence at Stradbally over the years, for a year or so from 1997 No.2 was withdrawn for repairs and the duo of Ruston and “Nippy” worked the passenger service together, however during this time the Ruston suffered a failure within its transmission and for a time “Nippy” along with the brake van worked on by themselves. Repairs to the Ruston were completed and also to No.2 and both re-entered service after a time. More disappointing was the news which delivered a hammer blow to the society in October 2002 that the boiler on the loco was beyond repair and a completely new replacement would be required. The following years proved difficult as fundraising took centre stage to allow work to progress and also to highlight the need for financial assistance which in the end was forthcoming from sources such as the Heritage council and many of the visitors who purchased books, traveled on the diesel hauled trains or simply offered donations. After a careful process of identifying our preferred construction contractor the tender for the construction of the new boiler was awarded to Israel Newtons in the UK. The boiler was constructed during early 2009 and arrived in Stradbally in June 2009. In line with our expectations the boiler was an excellent match for the old one (which we sent over to their works for precise measurements to be taken for duplication). However we were pleasantly surprised by just how superb the build quality has been found to be with very little trouble given thus far. The locomotive proudly returned to service at the 2009 Rally and over 2000 people traveled behind it during the weekend. Other notable developments have been the reopening after many years of our sister attraction of the steam museum in the town, No.15 and one of the passenger trucks is now on display for the public along with other steam and vintage vehicles. The refurbishment and development of the Museum was made possible by assistance from Laois Leader Rural Development Company and the Heritage Council. Over the years the operating days for the railway at Stradbally has grown from an annual event to now running on all Bank Holiday Sunday and Mondays from Easter to November along with a running day in conjunction with National Heritage Week in September, Stradbally Vintage club in June and for private parties by prior arrangement. The railway continues to be one of the only steam operated narrow gauge railways built, maintained and operated by volunteers as it has been since 1969, considerable assistance with the procurement of redundant track materials is provided by Iarnrod Eireann at the nearby Portlaoise Permanent Way Depot, and members of the Permanent Way Institute have helped the group maintain the track over the years. In recent years the newly established Laois Traincare Depot in Portlaoise has provided assistance with several staff becoming volunteers in the field of maintenance of the Diesel locomotives. The heritage Diesel division of Stradbally Railway is steadily developing with our Diesel fleet now consisting of four locomotives, two additional locomotives arrived from Bord na Mona Coolnamona in 2010 and a Lister engined Ruston Locomotive arrived in October 2011 and considerable progress has been made in restoring all three machines to full working order. The mix of Steam and Diesel motive power has helped attract a healthy cross section of working volunteers ranging in age from 18-73! And from such diverse professional backgrounds as the banking world, metal fabrication, accounting, a marine engineer, railway engineering and students to name but a few we look forward to what the future brings us in Stradbally in 2012 and beyond!